Entity’s Lenzi Brock of Vancouver, Wa., shows how to do a bridal manicure with the perfect hint of blue. Follow these steps for a custom wedding creation. 1. Apply two coats of Entity One Color Couture in White Light. 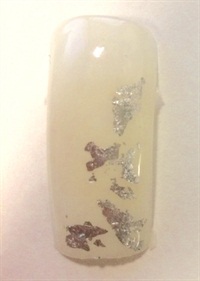 Place Young Nails silver foil along the right side of the nail. 2. Using Entity One Color Couture in Do it All Denim, start basic lines for lace. 3. 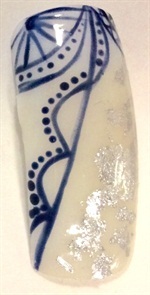 Add details for the lace and apply top coat. For more bridal nails with a hint of blue, click here. Check out the bridal-themed June issue of Nail Art Gallery Magazine here.